Definition of Potlatch: What is Potlatch? A Potlatch is an opulent ceremonial feast to celebrate an important event held by tribes of Northwest Indians of North America including the Tlingit, Tsimishian, Haida, Coast Salish and the Chinook people. A Potlatch is characterized by a ceremony in which possessions are given away, or destroyed, to display wealth, generosity and enhance prestige. 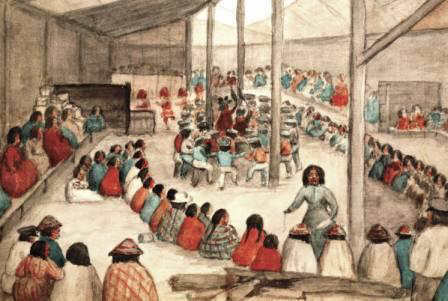 The term 'Potlatch' has been corrupted from a Nootka Indian word meaning "gift". The Nootka, now referred to by the name Nuu-chah-nulth, are one of the Indigenous peoples of the Pacific Northwest Coast of Canada. Many other tribes, especially among the Plains Indians, have traditionally practiced some form of potlatch, or give-away ceremonies and customs, highlighted by the lavish distribution of goods and food to tribe members of those of other clans, villages, or tribes. Potlatch Ceremony. Discover the vast selection of pictures which relate to the History and Culture of Native Americans. The pictures show the clothing, War Paint, weapons and decorations of various Native Indian tribes that can be used as a really useful educational history resource for kids and children of all ages. 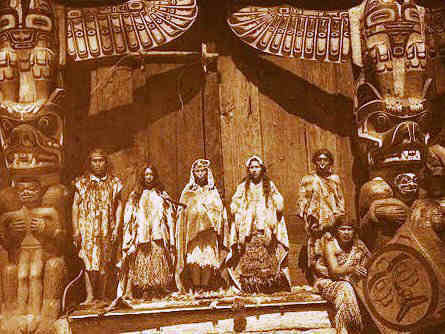 We have included pictures and videos to accompany the main topic of this section - Potlatch. The videos enable fast access to the images, paintings and pictures together with information and many historical facts. All of the articles and pages can be accessed via the Native Indian Tribes Index - a great educational resource for kids.